NOTE: This is not a separate event. This tribute is a part of the 8th Annual Golden Triangle Music Awards Ceremony. 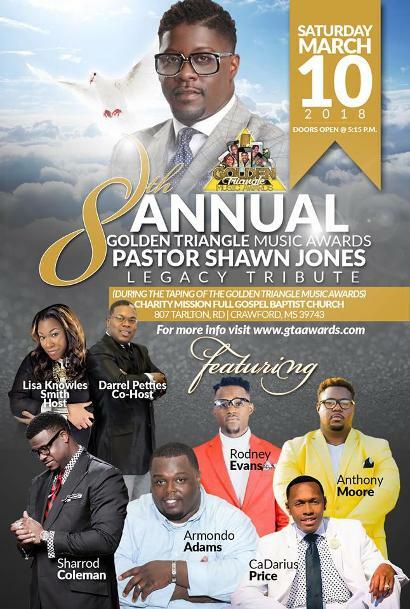 The founder and staff of the Golden Triangle Music Awards will celebrate a legend of Gospel Music during the taping of the 8th Annual Music Awards in March of 2018. Pastor Shawn Jones was an anointed pastor and dynamic Gospel Singer who transitioned in November of 2017. As he traveled the world spreading the Gospel, he touched the lives of thousands across the nation. On March 10, 2018 a Legacy Tribute will take place in honor of Pastor Jones at the Charity Mission Full Gospel Baptist Church. A segment of the Awards Ceremony has been set aside for this musical tribute. presented by: Harvey Watkins Jr. of the Canton Spirituals, performed by: Pastor Sharrod Coleman, Pastor Armondo Adams, Pastor Anthony Moore, Rodney Evans and CaDarius Prince, all lead singers of popular quartet groups. Each singer will perform one of the hit songs written and arranged by the legend himself, accompanied by the band and background singers of the Golden Triangle Music Awards. This is an event you do not want to miss.